Hello, and welcome to the Week 12 Actual Opportunity Report. Actual Opportunity is our approximation of how many fantasy points a player should score based on workload. If you’re unfamiliar with Actual Opportunity and how it applies to fantasy football, you can read the in-depth explanation here. Essentially, we’re using a 10-season sample of play-by-play data to calculate expected fantasy points from a player’s seasonal or weekly usage. 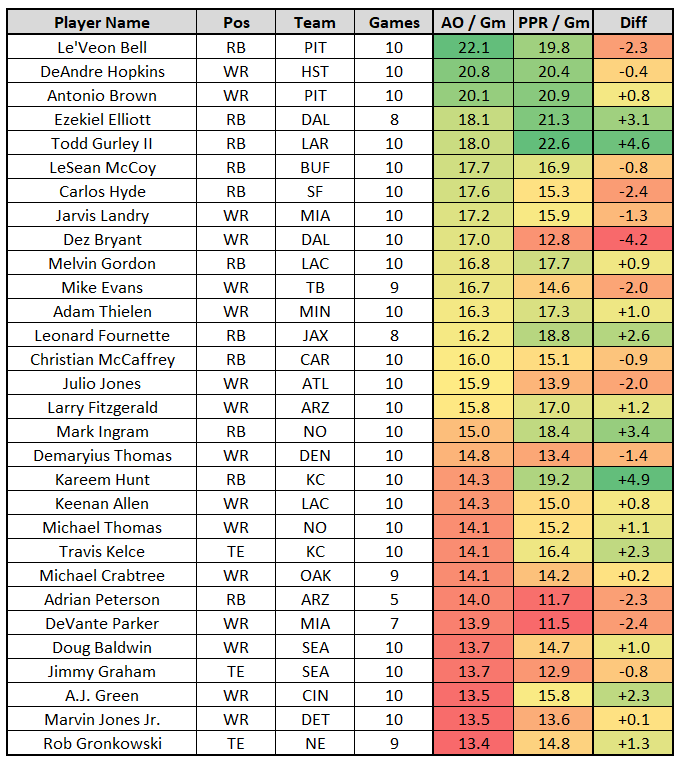 We look at each target (by distance from the end zone and depth of target) and each carry (by distance from the end zone and down and distance) and add this up to determine how valuable a player’s role is for fantasy purposes. We can contrast this with fantasy production to measure efficiency. Parker was our single least efficient player in Week 11, totaling 21.4 expected fantasy points, but scoring only 6.6. Parker saw nine targets in Week 11, including four red-zone and two end-zone targets. If we exclude Week 5 (when Parker played on only three snaps), he averages 16.0 expected fantasy points per game, which would rank eighth-best among all wide receivers. Parker is one of my top positive regression candidates at the moment, given the immense workload he has seen, but I do have one reservation. Last week Miami’s offensive coordinator Clyde Christensen said, “[Parker] doesn’t have the edge that he had coming out of training camp, but I do think that sometimes with those guys who are speed guys and outside guys you get a nagging thing and you just don’t feel 100 percent. I’d say that that is the reason [for Parker losing his edge].” It seems likely Parker’s injury has contributed to his inefficiencies this season, but, while I don’t know when he might be back to full health, the upside in terms of volume is clearly there. All of this being said, if Matt Moore is named the starter for Week 12, the Miami player I’d be most excited about (relative to expectations) would be Kenny Stills. Landry is still an especially strong start regardless of quarterback, ranking an astounding third among wide receivers in expected fantasy points per game (17.2), up against a New England defense allowing the second-most fantasy points per game to opposing slot wide receivers (15.8).